Paired organs such as lungs, breasts, ovaries, and kidneys are always under similar carcinogenic influence (genetic or environmental). The presence of malignancy in one increases the chances of synchronous or metachronous primary in others. However, popular argument against is that it can be metastatic spread from one to others. Bilateral renal cell carcinoma (RCC) is a rare entity and can present synchronously or asynchronously. Bilateral RCC can be familial or sporadic. Hereditary RCCs are often bilateral and occur at younger ages than sporadic tumor. Among the bilateral sporadic renal lesions, the occurrence of synchronous RCCs is almost equal or can be more than metachronous lesions. Multiple studies report that the incidence of bilateral RCCs is between 1% and 5%. Only <2% of patients with RCC can have synchronous sporadic lesions. Pathologically, usually in bilateral RCC, both histological subtypes are concordant, especially when metachronous; however, discordant subtypes can be present. Here, we present a case report of a patient with bilateral synchronous RCCs including surgical, pathological, and metabolic features of renal masses. A 52-year-old male patient with no significant family history of renal malignancies presented to us with diagnosis of bilateral renal masses. Initially, the patient presented with hematuria. He was investigated with ultrasound of the abdomen, which revealed bilateral complex renal masses at the upper pole of the left kidney and lower pole of the right kidney, respectively. Subsequent contrast-enhanced computed tomography (CT) scan of the abdomen suggested enhancing exophytic necrotic mass in the left kidney and large predominantly solid mass in the right kidney. Both masses appeared vascular. They were categorized as T2a tumors (TNM staging). A suspicious metastatic lesion was noticed in the liver. Fine-needle aspiration cytology was performed from both the masses. Cytological findings from the left kidney were positive for atypical cell while those from the right kidney were inconclusive. The patient was referred for fluorodeoxyglucose positron emission tomography/CT (FDG PET/CT) scan with intent to characterize renal masses and liver lesion. Following due consent patient underwent whole body FDG PET/CT scan as per standard protocols. FDG PET/CT images revealed intense heterogeneous FDG uptake in the left renal mass while the uptake in the right renal mass was minimal (isointense with normal renal cortex) [Figure 1]. Maximum standardized uptake value (SUVmax) in the left renal mass was measured 15.5. No FDG uptake was noted in cystic lesions in the liver and was concluded as benign. A solitary FDG-avid 1.5 cm nodule was seen in visualized sections of the left lung SUVmax measuring 14.4. No other metastatic lesion was identified in rest of scan. Based on PET/CT finding and clinical evaluation, the patient underwent radical nephrectomy on the left and partial nephrectomy on the right side. Histopathological analysis revealed conventional clear cell carcinoma in both kidneys [Figure 2]. Measurement revealed pT1b tumor on the right and pT3a on the left (due to sinus fat invasion). Perinephric fat and Gerota's fascia were free of tumors. Both tumors were “Grade III” on Fuhrman grade. On careful evaluation, the only histopathological difference found between the two masses was lymphovascular invasion (LVI) and necrosis present in the left renal mass. The difference of metabolic activity patterns between primary and presumed metastatic lesion suggests possibility of two separate disease processes. Here, we observed difference in metabolic patterns of both renal masses, suggesting that both the lesions though synchronous are of independent origins. Surprisingly, both the renal masses have almost identical histology, i.e., conventional clear cell variant. Even the Fuhrman grades were same for both tumors. Multiple authors have previously evaluated and correlated the variability of FDG uptake to various subtypes of RCC and also to Fuhrman grading. In the largest study of 68 patients, Bertagna et al. found no significant statistical correlation between FDG PET/CT results and Fuhrman grade or histology subtype of primary tumor. The present case is an excellent example of variable FDG uptake in RCC. The patient has developed bilateral synchronous RCC under similar carcinogenic influence still they have different metabolic characteristics. The only histological difference between these renal masses is presence of LVI and necrosis in FDG avid lesion. LVI is a well-known independent risk factor of poor prognosis in many malignancies. Studies also report that RCCs without LVI have longer metastatic or disease-free survival and overall survival. FDG PET/CT is the fastest growing onco-imaging modality where more and more authors are correlating biological information obtained from FDG uptake with molecular prognostic marker and clinical outcomes. Among common malignancies such as esophageal, lung, and colorectal cancers, the SUVmax values assessed by PET correlate with patient's outcomes. Studies had previously shown that high tumor glucose metabolism is a cellular characteristic that correlates with the aggressiveness of tumors. SUVmax values of RCC provide valuable prognostic information. Namura et al. evaluated 26 patients of advanced RCC and compared SUVmax values of renal primaries with overall survivals of patients. They concluded that RCC patients with high values of SUVmax could demonstrate poor clinical outcome. 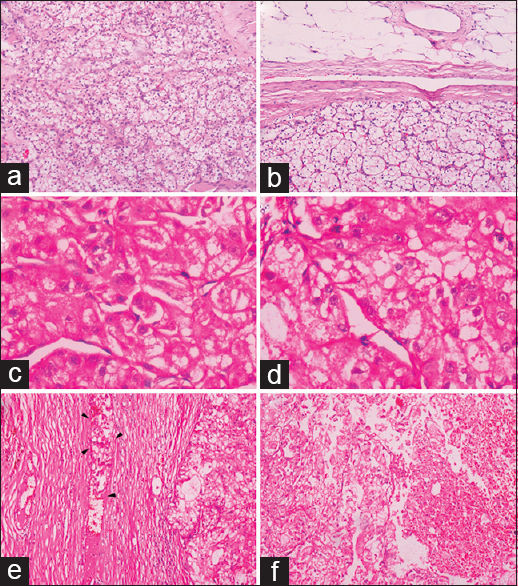 In our case, the FDG-avid lesion in the left kidney shows LVI and necrosis on histology [Figure 1] and [Figure 2], which in turn suggests the more aggressive nature of the left renal primary. Increased glucose metabolism in this lesion is in consideration with above discussion about aggressiveness and FDG uptake. Although TNM stage, Fuhrman grade, and histological findings such as LVI and coagulative necrosis are widely recognized prognostic factors in RCC,, research continues to determine strong and easily available prognostic parameters that could help to identify patients with aggressive disease before starting treatment. FDG PET/CT can be an ideal modality in such a case as it not only provides complete TNM staging of patients but also the prognostic information obtained in the form of FDG uptake is valuable too. Klatte T, Wunderlich H, Patard JJ, Kleid MD, Lam JS, Junker K, et al. Clinicopathological features and prognosis of synchronous bilateral renal cell carcinoma: An international multicentre experience. BJU Int 2007;100:21-5. Blute ML, Itano NB, Cheville JC, Weaver AL, Lohse CM, Zincke H, et al. The effect of bilaterality, pathological features and surgical outcome in nonhereditary renal cell carcinoma. J Urol 2003;169:1276-81. Boorjian SA, Crispen PL, Lohse CM, Leibovich BC, Blute ML. The impact of temporal presentation on clinical and pathological outcomes for patients with sporadic bilateral renal masses. Eur Urol 2008;54:855-63. Bertagna F, Motta F, Bertoli M, Bosio G, Fisogni S, Tardanico R, et al. 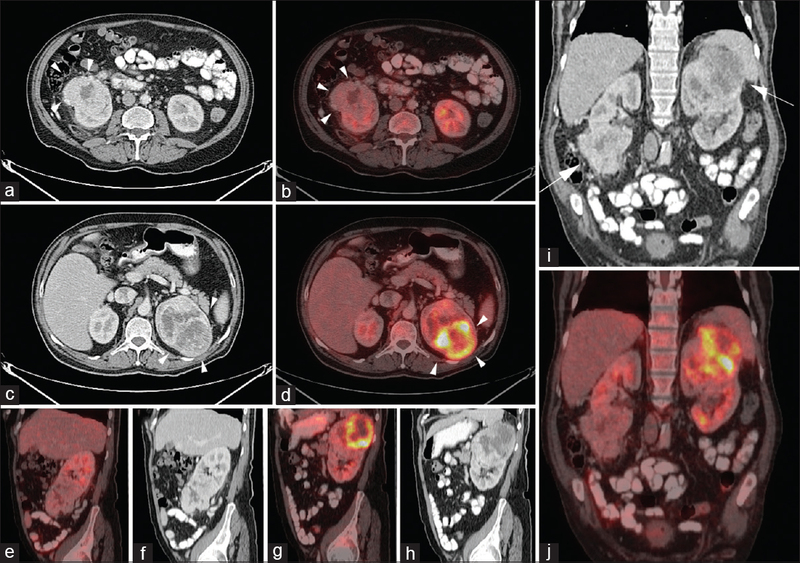 Role of F18-FDG-PET/CT in restaging patients affected by renal carcinoma. Nucl Med Rev Cent East Eur 2013;16:3-8. Katz MD, Serrano MF, Humphrey PA, Grubb RL 3rd, Skolarus TA, Gao F, et al. The role of lymphovascular space invasion in renal cell carcinoma as a prognostic marker of survival after curative resection. Urol Oncol 2011;29:738-44. Higashi K, Ueda Y, Ayabe K, Sakurai A, Seki H, Nambu Y, et al. FDG PET in the evaluation of the aggressiveness of pulmonary adenocarcinoma: Correlation with histopathological features. Nucl Med Commun 2000;21:707-14. Ferda J, Ferdova E, Hora M, Hes O, Finek J, Topolcan O, et al. 18F-FDG-PET/CT in potentially advanced renal cell carcinoma: A role in treatment decisions and prognosis estimation. Anticancer Res 2013;33:2665-72. Namura K, Minamimoto R, Yao M, Makiyama K, Murakami T, Sano F, et al. Impact of maximum standardized uptake value (SUVmax) evaluated by 18-fluoro-2-deoxy-D-glucose positron emission tomography/computed tomography (18F-FDG-PET/CT) on survival for patients with advanced renal cell carcinoma: A preliminary report. BMC Cancer 2010;10:667. Frank I, Blute ML, Cheville JC, Lohse CM, Weaver AL, Zincke H, et al. An outcome prediction model for patients with clear cell renal cell carcinoma treated with radical nephrectomy based on tumor stage, size, grade and necrosis: The SSIGN score. J Urol 2002;168:2395-400. Sengupta S, Lohse CM, Leibovich BC, Frank I, Thompson RH, Webster WS, et al. Histologic coagulative tumor necrosis as a prognostic indicator of renal cell carcinoma aggressiveness. Cancer 2005;104:511-20.